Meet This Head Turning Mid-Century Apartment! The answer to your style needs is here. Some home design ideas can become reality and proof of that is this mid-century apartment designed by a Russian designer. Filled with amazingly chosen colours while maintaining its sobriety, this is the home decor inspiration you’ve been dreaming about! If you’re looking to revamp your living room add some splashes of blue hues to complete the sober look you’ve been decorating with. Blue is always a good option when you want to make an appearance in a neutral room. Meant to be a family home this interior design project brings us a unique experience of living. While drawing a lot of inspiration in the practicality of industrial design featuring elongated spaces and the gracious big windows, this just shows that charm and functionality can go hand in hand. A mid-century modern style, this home has a gracious taste while never forgetting the way style and practicality can enjoy the fun. The wood flooring makes a particular appearance making the room feel cosy. The whole room has a family touch to it. The bedroom style is simple yet modern and presents itself with an outstanding way of being enchanting with decoring the intimacy of the room. As always, lighting has a special place in the project. With notable lighting design making this one of the featured projects in lighting, the mid-century atmosphere is present throughout the room in its own special way. Hanna is a vintage lighting fixture that is elegantly by five arms and five lampshades made of brass. Each lampshade can be adjusted to direct lighting over a wide-reaching area. Liven up your home setting with this classic pendant light, that will suit superbly in a mid-century modern living room or dining room. All in all, Hanna suspension lamp has flowing lines and a sleek surface that mixed unusual-shaped arms create a vintage lighting design like any other. 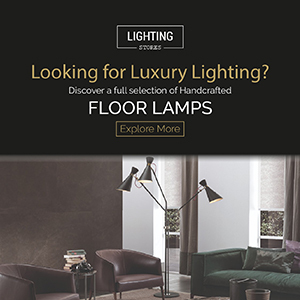 YOU MIGHT ALSO LIKE: Modern Lighting Ideas: A Fitted Modern Floor Lamp For You!